If I were to ask you what you dislike about your body, your answer would likely be connected to impossible ideals of masculinity and femininity. Whether it’s a super model that “needs” photo shopping to be cover ready, or the ways we police body size, all of us are “failing” at gender to some degree, which means the gender binary doesn’t serve any of us. In January of 2016, I had an epiphany: gender nonconforming and trans people are actively teaching us how to shift our perspective of the binary, and find the possibility in perceived failure. They are teaching us how to express ourselves with a greater amount of gender freedom. In essence, they are super heroes. 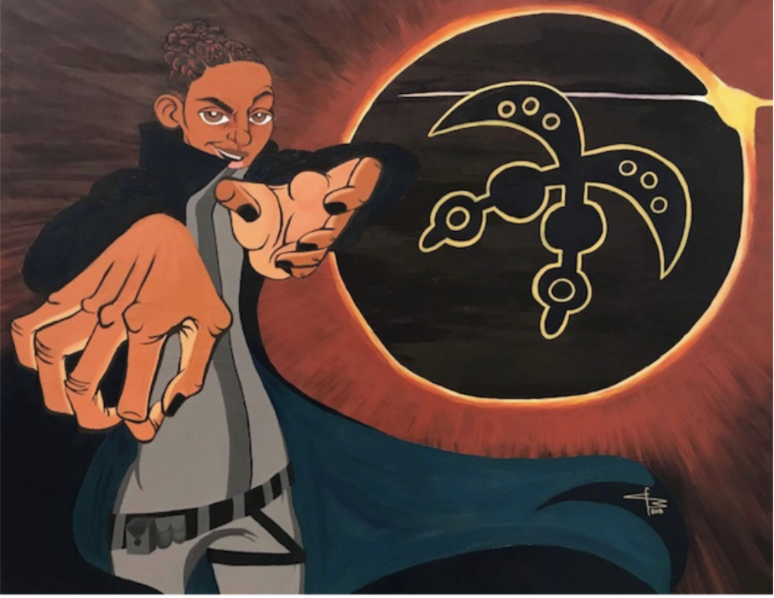 Afrofuturism is a liberatory art form that speculates what freedom from oppression can look like in the technological future for black people. One of the most common forms of Afrofuturistic production is comic art that feature super heroes paving the way to liberation. Using afrofuturist styling, Transfuturism argues that trans and gender fluid people are doing this in the flesh, not as a future state of being, but in our present reality. In essence, they are modern-day super heroes. Transfuturism is a photography, oral history, and Afrofuturistic art-activism project. First, Amber Johnson, a Black gender fluid artist, photographs and records the narratives and lived experiences of trans and gender fluid people of color to illustrate how transgressing gender affords a particular form of liberation, but also leads to new forms of identity challenges. Second, Wriply Bennet, a Black Transgender woman and artist, creates a comic book sketch that transforms the participant into an Afrofuturistic super hero. Then, together, they paint a large portrait of the superhero comic borrowing elements from the interview to build the environment of the character. Within comic and cartoon forms of entertainment culture, gender fluid or visibly trans folks have been painted as antagonists or comedic punch lines while the heroes are often painted as clearly Cis gender, and mostly strong cis masculine HEROes. We chose to capture each participant as an Afrofuturistic comic super hero in order to show the possibility inherent in breaking the gender binary. Rigid gender rules force everyone to conform to toxic ideals of femininity and masculinity. The body that breaks the binary teaches others that they do not have to conform to strict gender rules, and instead can live their life authentically. If people begin to see the value in non-binary and trans people through this humanizing, narrative based campaign, then gender-based violence will decrease. To date, we have interviewed eight people and painted three super heroes. The funds from this project will pay Wriply Bennet for her labor and vision, and purchase more canvases. Below are photographs, sketches, and paintings of the first three participants. Our goal is to paint as many trans and gender fluid people as time and money will allow because it is crucial that we illustrate pan-gender and femme gender folx IN THEIR OWN POWER! !